The International Pharmaceutical Excipients Council of the Americas (IPEC-Americas) is the global association of manufacturers and users of pharmaceutical excipients and the organizer of Excipient World. IPEC-Americas focuses on the applicable law, regulations, science, and business practices of excipients, and strives to develop the most in-depth, innovative and comprehensive education program presented over three days at Excipient World. IPEC-Americas is proud that Excipient World’s conference program is internationally recognized as one of the best education programs in the pharmaceutical industry, covering every aspect of excipients. Excipient World’s conference is a platform for industry experts to educate drug, biologics, veterinary medicine, medical device / combination product and other excipient user manufacturers on the latest excipient formulation and delivery system innovations and technologies, regulation and compliance mandates, new drug and product applications, and other topics. 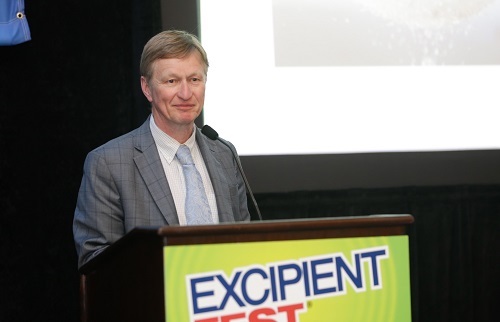 Excipient World is a platform where professionals can advance their career, present their latest research, and help hundreds of professionals improve their skills. Excipient World speakers are from leading pharmaceutical and biotech companies, excipient manufacturers, government agencies and universities … and we want you to be a part of it! Thank you for your interest in speaking at Excipient World 2019. We are no longer accepting abstracts for this year’s program. for three full days of education, sourcing and networking! Excipient World offers opportunities for industry suppliers to present an education session on excipient solutions as a gold sponsor. Companies must be an exhibitor before they can select a sponsorship. Presentations must be technical or educational content only. Presentations are not to be marketing focused or sales pitches, which can leave a negative impression on the audience about your company. IPEC-Americas strives to maintain a total science, quality and safety education focus and educational integrity for every conference. All gold sponsors must submit their presentation abstract for review and approval using the Abstract Submission Online Form link above. Click here for more information on available sponsorships.